Giorgio Chiesa is the son of an influential family in Italy. He was baptized in St. Paul’s Cathedral in the Vatican, in an ecumenical ceremony presided by Pope Paulus VI and a Muslim imam. As a child, he remembers several times when Karol Wojtyla (Pope John Paul II) visited his mother at her house. Chiesa became an agnostic. He grew up going to the best schools and universities in Europe, studying law and international business, and thinking that religion was a human invention and God was not real. In 1999, while on a round-the-world trip between jobs in London, Chiesa met his future wife in Spain. Alejandra was born into an Adventist family in Colombia but left the church in her late teens due to a family crisis. She had moved to Spain years before to live with her brother. After dating for some time, Giorgio and Alejandra got married and moved to London where she started attending the local Adventist church. Chiesa used to take his wife to church but did not participate because, as he said, “Church was not for me.” After eight years and two children living in England, they moved to Switzerland. There Alejandra met an Adventist lady from Argentina, and they became very good friends. Four years later they moved to Buenos Aires, Argentina. While there, Giorgio’s dearest sister passed away from an aggressive cancer. Giorgio and Alejandra were devastated. While in grief, Alejandra’s Argentinian friend recommended they watch the video of an Adventist pastor at the Spanish-American Church in Collegedale, Tennessee, United States. Religion started to make sense to Giorgio. Three years later the family relocated for work reasons to the Bahamas. They began to watch the Collegedale Spanish-American worship service online almost every Sabbath for several years. One day they called Joel Barrios, pastor of the Spanish-American Church in Collegedale, and invited him to come to the Bahamas. Barrios went and stayed at their home, giving them a few Bible studies that he had previously shared with agnostics and atheists. It was a miraculous experience. When Barrios left the Bahamas, the family was not only happy—they were spiritually united. In December 2017, they Skyped with Barrios to continue studying the Bible. Then they went to Colombia for the holidays, with plans to go skiing in Canada in February 2018. While their ski equipment was being sent from Colombia to the Bahamas via courier, it was stolen. Chiesa told the family that they would buy new equipment and go to Canada anyway. While returning from Colombia, however, Chiesa fell at the airport and broke his right arm, preventing them from going skiing. The family was saddened, as they loved skiing. A few days later, Barrios called Chiesa to invite the family to an evangelistic meeting in Tennessee. By a miracle of God, relates Chiesa, the dates for the meeting coincided with those of the skiing trip, and the family agreed to travel to Tennessee. The family, and Chiesa in particular, were impressed with the practical topics shared by Roger Hernandez, speaker for the evangelistic meetings and Southern Union ministerial director. “My 12-year-old son, who is always complaining about attending church with his mom, was excited with his new church friends,” he said. During the week, Chiesa made the decision to get baptized, and on that Friday, Alejandra decided to be rebaptized. 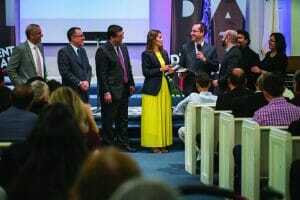 Giorgio and Alejandra Chiesa will be the first online members of the Spanish-American Church, requesting to be members in Tennessee. The Chiesas praise God for giving them faith and a new family in Christ. “We are excited about our newfound faith in God, and our new online church family,” they said. An original version of this story was first published in Southern Tidings.